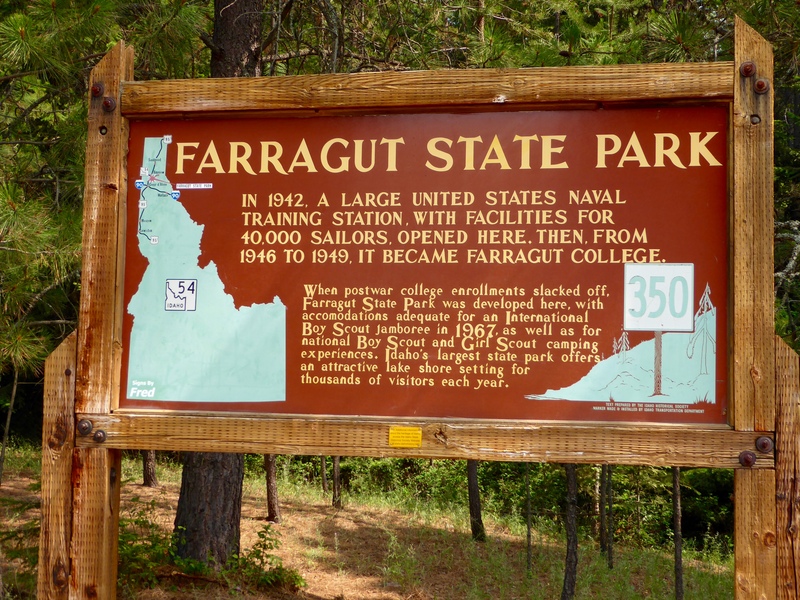 We have had an eventful first week as camp hosts in Farragut State Park! 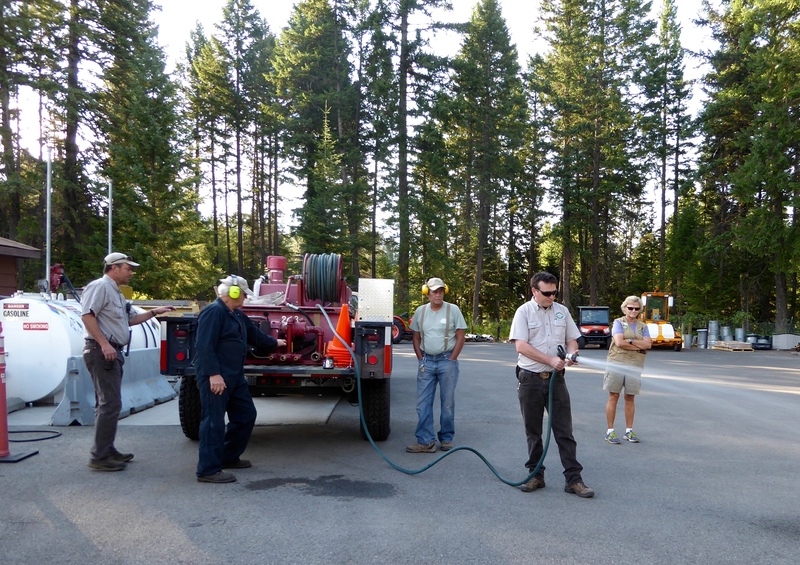 In preparation for the packed Fourth of July Weekend we helped to make sure all sites were ready and were instructed about the Stage 1 Fire Alert – meaning no fireworks, only low profile campfires in provided fire circles and smoking only on established campsite pads. The Fourth of July was actually fairly uneventful – just a few people who thought they were special enough that the fire alert didn’t apply to them. In the evening many campers went the three miles to the nearby town of Bayview to view fireworks over Lake Pend Oreille. Many used their boats to get a good view and when the fireworks were over, some people decided to beach their boats or tie them up to retrieve them the next day. Overnight the wind really picked up and some boats were swamped, sunk or broke away and ended up in places around the lake. While we were cleaning sites the next morning we started to hear on the park radios about people trapped around the lake and the dicey retrieval and recovery. Then we heard the first mention of smoke. 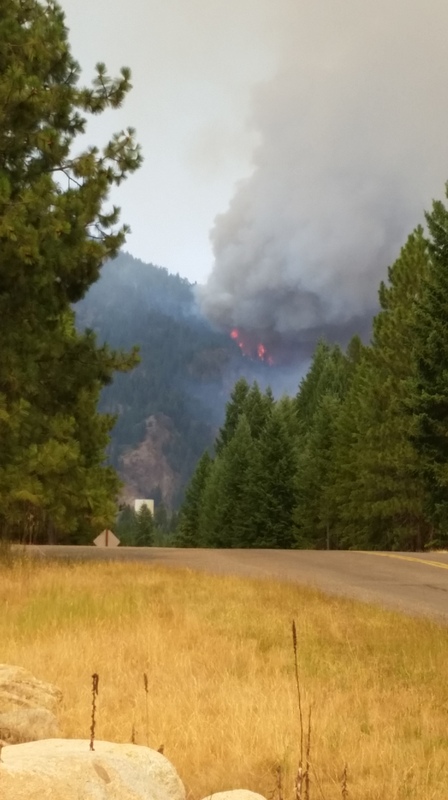 Over the next hour the smoke turned into a full fledged fire, later named the Cape Horn Fire. The town of Bayview was threatened and people were asked to evacuate. That is when Randy and the two other guys took the pumper truck out and stayed for most of the day into evening. Due to falling ash, our park manager called for the evacuation of two of the four campgrounds in the park and closed day use areas. When I came back to the trailer, I prepared as much as possible for potential evacuation. I had a few bags of things to take if we had to leave in a hurry and then prepped the trailer for a less hasty retreat if needed. Those things stayed packed and the trailer remained in readiness for several days. This park is bisected by a state highway and there are several access points into the park. 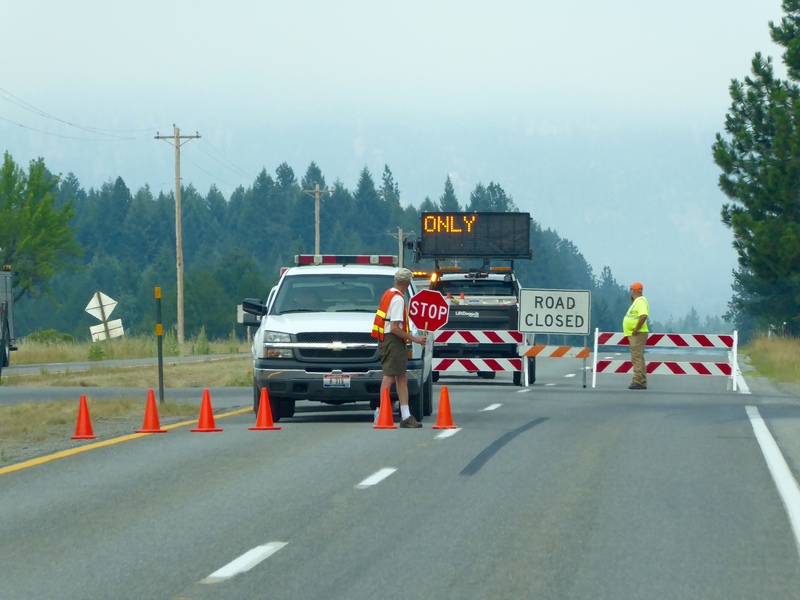 Over night the highway was closed to all but emergency personnel and we were asked to help man “round the clock” road blocks so that only those with confirmed reservations into the two remaining campgrounds could enter. I shared the 10 PM – 1:00 AM duty with one of our partner wives and Randy pulled the 1:00 -4:00 AM shift. It was an interesting, and very sad assignment to see the many area fire trucks and support vehicles coming through the park towards Bayview and the fire. It was stunning to see the Cape Horn mountain on fire at night, beautiful and very sad – especially since this was a man made fire, details to be determined. For those of you with feminine pride, Farragut’s only female full time ranger, Errin, was the ranger on duty when the fire started and remained the park incident commander for the first two days. 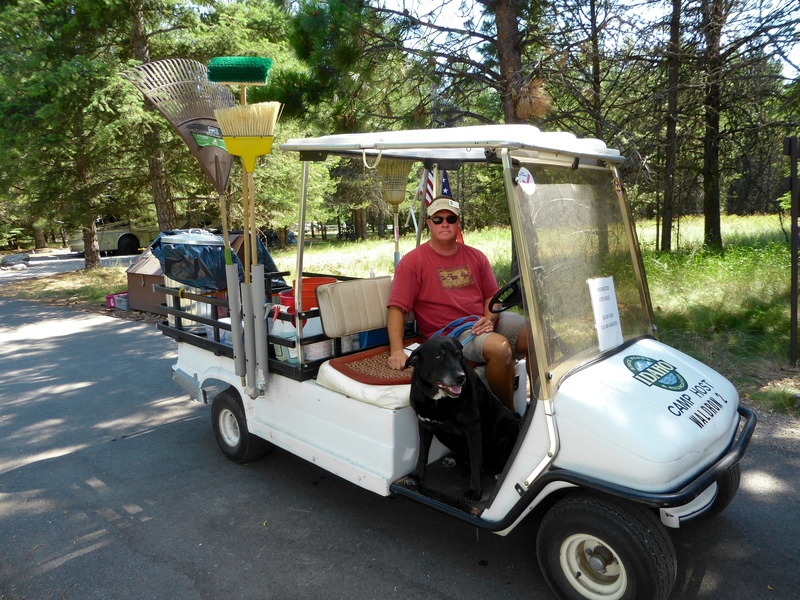 We are so glad that Idaho Parks allow us to have radios so that we had an idea of what was going on. We could hear she was doing a great job dealing with a million things at once. For the next three days we had many people opt to leave the campground and just a few people came in. All day use areas of the park were closed to keep visitors to a minimum in case we too were evacuated. 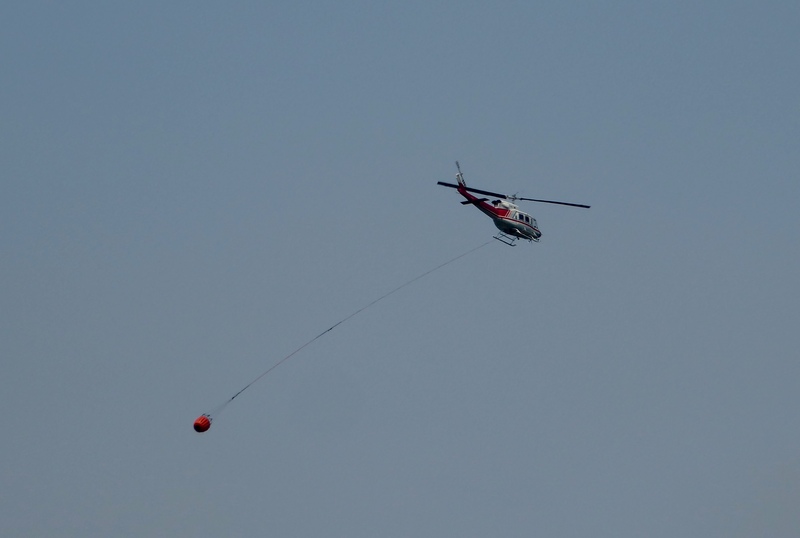 There were crews in helicopters, planes, boats and on the ground fighting the fire and we were always glad to hear and see them. One of the evacuated campgrounds was home to firefighters for a few nights and some operations continue to be based in the park. As of about 48 hours ago, the federal agencies took responsibility for the fire. We have US Forest Service, National Interagency Fire Center, and FEMA folks and probably others. There are Air Force and Navy facilities on the lake so surely they are involved. We heard this morning that the fire has turned away from Bayview and the park and is 35% contained with most of that containment being along the lake. The park manager is unable to ban campfires in the park altogether. There are campers who are dumbstruck at those who still want to have campfires, given the situation, and others who are verbally abusive when we suggest they not have a campfire. Currently the camp hosts in the two open campgrounds are banding together and refusing to sell firewood. We can’t stop those who bring in their own wood from burning, but we aren’t going to sell them more. Our little corner of the world is slowly returning to normal. We still have pending road block duty tonight and tomorrow but the park is scheduled to return to normal operations on Friday. I unpacked our emergency bags and set the trailer into living mode again. I’m not sure we are officially off evacuation alert, but it feels like it. Keep those campfires low, folks. All the best from Waldron Campground at Farragut State Park.